The Frankfurt Fintech savedroid, whose Token Sale is currently approaching the finish line, has secured a second exchange for the trading of the SVD Token. 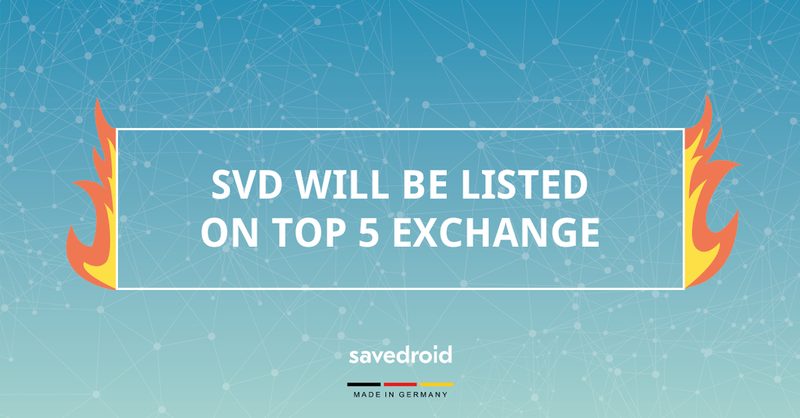 SVD will thereby soon be trading on a top 5 cryptocurrency exchange. savedroid already announced some time ago that HitBTC is the first exchange that has confirmed the listing of SVD — although, this does not mean that SVD will be listed on HitBTC before it will be listed on other exchanges! The new exchange is one of the top 5 trading sites according to data from coinmarketcap. Which exchange it is exactly will be published in good time, before the start of trading. “Securing a second well-known exchange shows that SVD is an attractive token for the large crypto exchanges. This allows us to create trading opportunities for token buyers on the best exchanges, which is good for liquidity. “ says Dr. Yassin Hankir, founder and CEO of savedroid. It won’t be only these two exchanges. savedroid is currently in talks with other exchanges, which will be announced, at the latest, after the end of the ICO. The token sale goes on still until March 9th, 2018. So far, around four billion tokens have been sold. In total, six billion tokens are available for sale. So savedroid has already established itself as one of the most successful German ICOs. With the proceeds of the token sale, the Fintech company plans to build a trading platform for simple and mass market compatible trading and saving of cryptocurrencies. Among other things, so-called “smart saving” based on artificial intelligence will be possible. Here, an algorithm will assist investors in selecting the most interesting tokens and coins and will allow saving with savings plans.